Duo Country US, Joe Carter (né le 27 Février 1927 à Maces Springs (Virginie), décédé le 2 Mars 2005 à Maces Springs (Virginie)) et Janette Carter (née le 2 Juillet 1923, décédée le 22 Janvier 2005 à Kingsport (Tennessee)). Ils sont les enfants d'A.P et Gladys Carter de la Carter Family. 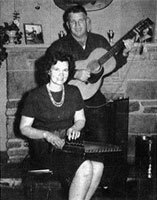 US Country duo, Joe Carter (born on February 27, 1927 in Maces Springs (Virginia), deceased on March 2 2005 in Maces Springs (Virginia)) and Janette Carter (born on July 2, 1923, deceased on January 22, 2005 in Kingsport (Tennessee)). They are the children of A.P and Gladys Carter of the Carter Family. Janette Carter was the last surviving member of country's immortal Carter Family, championing the cause of traditional American roots music into the 21st century. Born July 2, 1923, in Maces Springs, VA, she was the youngest daughter of A.P. and Sara Carter, who with A.P. 's sister-in-law Maybelle comprised the original Carter Family that in 1927 signed with RCA Victor producer/talent scout Ralph Peer. Over the course of classics like "Bury Me Under the Weeping Willow," "Keep on the Sunny Side," and "No Depression," the Carters introduced the pure, poignant harmonies and intricate melodies that would define country & western for decades to follow, establishing the trio as the most influential group in roots music history. Despite their commercial success A.P. and Sara Carter divorced in 1932. Seven years later, Sara married A.P. 's cousin Coy Bayes and relocated to California, taking her children with her. The Carter Family concluded its recording career in 1941, but in 1952 both A.P. and Sara agreed to a comeback, enlisting Janette and her brother Joe before signing to the Acme label to record some 100 songs over the next four years. Following her father's 1960 death, Janette — at the time an elementary school cook — dedicated her life to preserving their music and legacy, hosting informal music programs at A.P. 's Poor Valley, VA, retail store. Although she never earned the commercial or critical acclaim awarded her sister June Carter Cash, Janette also mounted a solo career, in 1972 releasing her debut LP, Storms Are on the Ocean, on the tiny Birch label. Howdayadoo followed on Traditional Records a year later. In 1976 she established the Hiltons, VA-based Carter Family Fold, a nonprofit amphitheater and museum site built from old railroad ties and school bus seats dedicated to the old-time music of rural Appalachia. Despite the Fold's strict adherence to traditional acoustic music, Janette eventually eased her restrictions in order to allow her brother-in-law Johnny Cash to play an electric set. Carter continued hosting weekly concerts at the Fold into her eighties, and in 2004 the Bear Family label assembled Deliverance Will Come, compiling the entirety of her slim solo output. She died in Kingsport, TN, on January 20, 2006, following a long battle with Parkinson's disease and other illnesses.